1盎司2014珀斯铸币厂马年狮密印银币 With limited mintage of just over 60000 coins, this coin combines the Perth Mint's popular Lunar series with a privy mark of a Bavarian Lion. 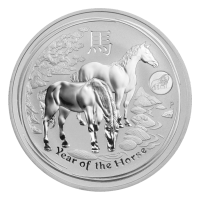 In 2014, The Perth Mint's internationally renowned Australian Lunar Silver Coin Series II celebrated the Year of the Horse, the seventh animal in the 12-year cycle of the Chinese zodiac. These superb quality releases are perfect for people born in "horse" years - 1942, 1954, 1966, 1978, 1990, 2002 and 2014 - who are regarded as hardworking, sociable, optimistic and energetic. The reverse of each coin depicts two horses within a stylized Chinese landscape. The Chinese character for "horse" and the inscription "Year of the Horse" also appear in the design with The Perth Mint's traditional "P" mintmark along with a lion privy mark. As well as appealing to silver coin collectors, these outstanding releases also make great gifts for people born in any year "ruled" by the Chinese lunar horse.